Are you overwhelmed by the wealth of opportunities all around you? Perhaps you allow yourself to be pulled in many directions for fear of missing out on THE opportunity that could change the trajectory of your business? Are you tempted to say yes to everything because you think you should? The giant underlying problem with saying yes to every opportunity is the opportunity cost. When you choose one alternative, you lose the potential gain from other alternatives . That’s because you cannot do it all! That is a fact. When you say yes to one thing, you’re essentially saying no to something else, and possibly something better. Each opportunity requires your time and focus or that of your team, so you must be discerning with which opportunities to take on. Filter opportunities against your strategic plan and vision of success to know if they support your goals or derail you from them. There is nothing wrong with having opportunities. When you choose the right ones, they become blessings in your business. What’s important to realize, though, is not every opportunity is created equal. Each opportunity presents a different return on your investment of time, focus, energy, and money. Many opportunities can steer you totally off course if you’re not careful. There are high stakes for each investment. You could say yes to something that is not a great fit and max out your resources. Then, when THE perfect opportunity comes along, you would have no more resources to allocate to it and must turn it down. 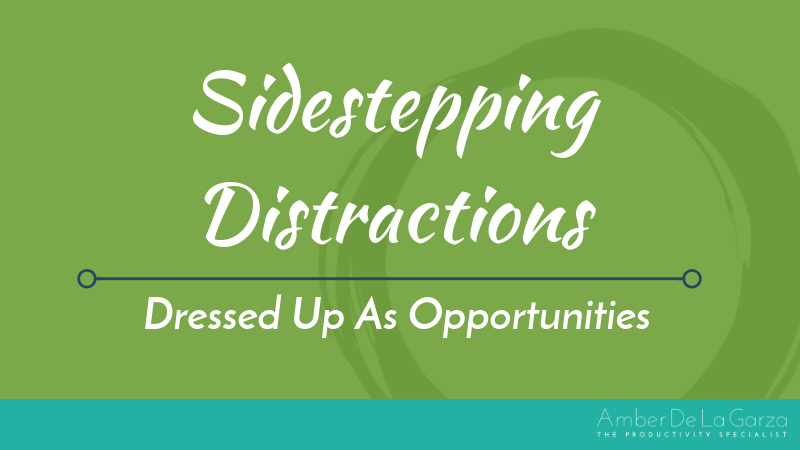 Be aware of which distractions are commonly dressed up as opportunities so you can sidestep them and focus on what matters. Before you agree to sell a program, course, or other project with someone, contemplate if it’s someone you want to work with that you can trust to hold up their end of the deal. Are they reliable? Do their strengths complement your weaknesses? Is the expected outcome worth the extra effort needed to launch? Platforms like blogging and podcasting can be great marketing tools but they’re also time-consuming and have sizable learning curves. Determine if you’re ready to commit your resources to such platforms for the long haul. You typically will not see a ROI overnight. Also, platforms like Blab reached celebrity status overnight then shut down abruptly just three years later. As fast as new marketing platforms show up and take center stage, they can go away. Never put all your marketing efforts in one basket and certainly not in a platform that may just be a short-term trend. Contemplate whether the attendees or listeners are your target audience and if you’re likely to gain their business. If not, determine whether the pay is worth your time. Don’t forget to consider all the hours you’ll spend corresponding via email and phone calls in your calculation. Will you even need to spend hours customizing your topic and thereby attract the wrong clientele anyway? If so, it’s not a good fit. A request for coffee from someone you don’t know or was not introduced to you may seem like an opportunity to meet someone who could open doors, build a relationship, or gain a client. More than likely, it’s not. Instead, they likely want something from you, be it free advice or an introduction to someone else. Don’t be afraid to ask why they want to meet with you. When they respond that they just want to pick your brain, don’t hesitate to say no. If you attend networking events or join associations for marketing, education, and business purposes and not purely for socializing, they need to be serving you. If you don’t gain the knowledge or clients you seek after consistently attending for six months, take your resources elsewhere. Such opportunities are just distractions. Knowledge is power but if you keep acquiring more knowledge without giving yourself time to reflect on what you’ve learned and the energy to take action on it, it’s useless. Be discerning with which forms of education win your attendance. There’s always going to be a trendy, new app that packs a bold promise and underdelivers because it fails to acknowledge the human variable. There’s also a cost to downloading every app that could possibly serve you. It takes time and energy to learn its functionality and, in many cases, a hefty monthly payment as well. Only integrate apps that will aid your productivity and you believe you’ll actually use. Constantly interacting on social media pages and groups is a popular method to obtain business and it works for a ton of people. Just make sure the time you spend there is data-driven. Don’t live on social media solely based on the opportunity to make connections with nothing to show for it. Every incoming email, text, or phone call can seem like the next big opportunity. The problem is, if you react to all the chimes, dings, and rings you hear, you can’t stay laser-focused on whatever you’re working on. Process your emails, texts, and voicemails only during scheduled breaks or time blocks. Worried your customer service would suffer? Hire someone else to handle communications or simply manage expectations everywhere you can via autoreplies and voicemail greetings. Clear communication is key to meeting expectations and providing exceptional customer service. You’re likely full of ideas. What entrepreneur isn’t? But 100% of great ideas not executed on, are 100% worthless. If you allow your various ideas to overwhelm you and turn into half-assed projects everywhere, you’re breeding undesired chaos. Narrow down your ideas to the ones that promise the greatest ROI and double down on them instead of letting the trove of them distract you. Opportunities can be just that – opportunities. They can also be distractions in disguise – distractions dressed up to look like opportunities when they really just steer you off course from your goals. Distractions steal your time, focus, energy, and money. Fail to sidestep such distractions and you’re committing to a much more circuitous path to success rather than the fast track you should be on.